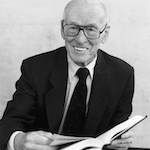 University of Wisconsin–Madison biochemistry Ph.D. alumnus and UCLA Professor Emeritus of Biochemistry Paul Boyer died on June 2 at the age of 99. Boyer carried out groundbreaking research in the department as a young scientist and earned a Nobel Prize in chemistry at the University of California, Los Angeles (UCLA) in 1997. Even as a young scientist, Boyer was a prolific researcher. During his time at UW–Madison, he discovered the first known function for potassium. After earning his Ph.D. in 1943 he performed research at Stanford University, investigating how to stabilize blood plasma without refrigeration. That work was used on the battlefield during World War II. After almost two decades at the University of Minnesota, he joined UCLA in 1963. In his early years at UCLA, he helped start and lead their Molecular Biology Institute, which opened in 1965. His most momentous achievement at UCLA came when he earned the Nobel Prize in chemistry for his groundbreaking research on adenosine triphosphate, or ATP, which is the main energy source for biological reactions in the cell. ATP is the vehicle by which nutrients in plants and animals are put to work to perform almost all cellular activities that require energy, such as making new cells and contracting muscles. Boyer referred to ATP as the “currency of the cell.” Over decades of work he helped decipher how ATP functions. Boyer used a large portion of his Nobel Prize winnings to fund support for postdoctoral awards at several universities, including UW–Madison. The Boyer Award for Postdoctoral Excellence in Biochemistry recognizes a postdoctoral researcher in the UW–Madison Department of Biochemistry for his or her excellence in research. The postdoc also gives a lecture as part of the Boyer Lecture Series. Eric Montemayor, who was a postdoc and is now an assistant scientist in the lab of Professor Sam Butcher, won the award in 2014. Some information from the UCLA Newsroom. See source story here. To read a memorial resolution on Boyer, click here.